Positive Coaching Alliance recommends that players act as sponges, soaking up all the information, instruction and experience possible. That applies to practices, team meetings, games, watching televised games, classrooms, outside reading and everyday life experiences. 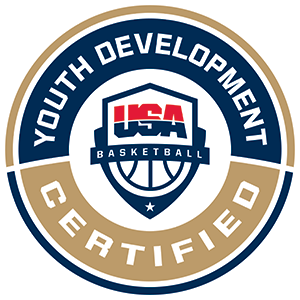 All the opportunities for knowledge that pile up through basketball can help players develop into better athletes and better people. Because basketball holds players’ attention, it creates an opportunity for them to understand how to focus their attention on any task at hand on or off the court. Making that connection explicit in players’ minds is a great gift for a coach to give a player. The shoulder crossover is like any other crossover in that the ball will change from one hand to the other. The difference in the shoulder crossover is that the player will cross the ball over higher while keeping it in the original hand and shifting their shoulder and arm to the other side of their body. 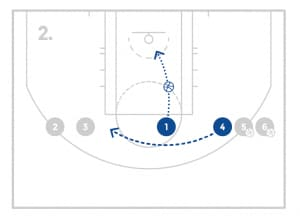 That means the player would take the ball from their right side to their left side by moving their right arm and the ball to the left side of their body to dribble. Have the players partner up, get 1 ball, and find some space on the court. The player with the ball will take 1-2 slow dribbles towards the other player who will pretend to be a defender. The defender will place one of their hands down low like a dig hand to deflect a a crossover, or extend their arm out in front of them at around chest level. The offensive player will read the defensive players hand and make the appropriate move. If the players hand is down, the offensive player will make a high/shoulder crossover and dribble past them. If the players hand is up, the player will make a low crossover and dribble past them. Continue this process for the allotted reps and switch partners. The player will then turn and come back. Have the players work on reading the defense as they make their dribble move. Have the players partner up with one ball. There can be 3 lines at a basket (both wings and top). Have one player start on offense and the other on defense. As the offensive player drives by, the defensive player should move with them and put their arm on their body. The offensive player will work on getting their inside arm that is closest to the defender on top and in front of the defenders arm. The offensive player will continue by and shoot and then the partners will switch until the allotted number of shots have been reached. Have the players get into 2 lines, 1 at the top and one on the wing or corner. Have the balls start in the line at the top and have the player with the ball dribble towards the wing. 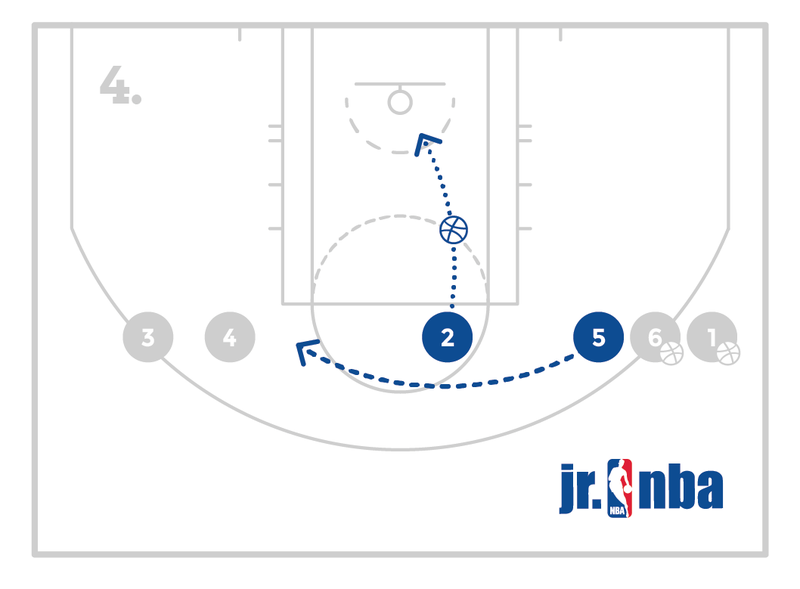 The player on the wing must time the cut and step up and then back cut. The player with the ball will snap a bounce pass to the cutting player who will take a lay-up. 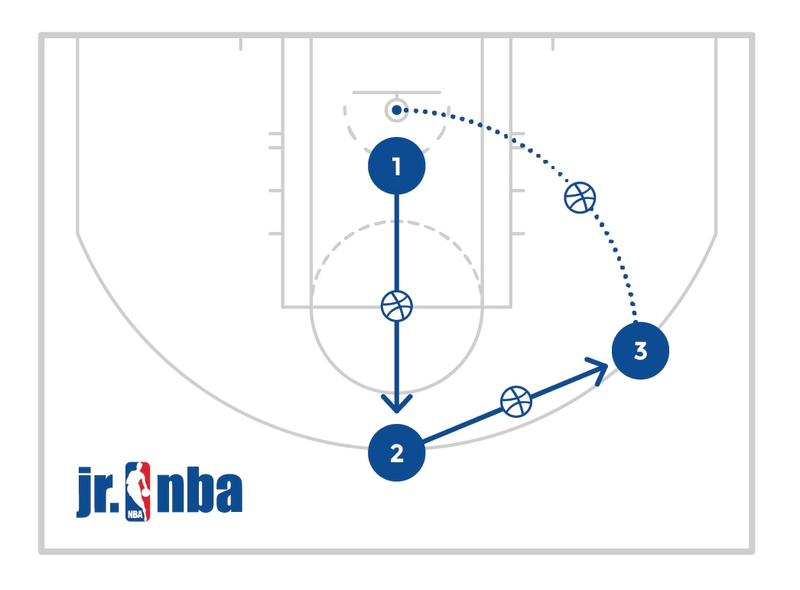 After the pass and the lay-up, the players will get the rebound and switch lines and continue. Based on numbers, you can utilize 2 groups or 4 lines at each basket. Have the players get in groups of 3. There will be 1 player that shoots 10 straight shots. Another player will pass, and another player will rebound. After 10 shots, the shooter will become the rebounder, the rebounder will become the passer, and the passer will become the shooter. This process will continue until the players get the allotted amount of shots. Use this drill to get a lot of game speed shots. Make sure the rebounder is hustling for rebounds and the passer is giving good game passes. A passing line is on the wing. An offensive player, pretend defensive player and a screener are on the other side. 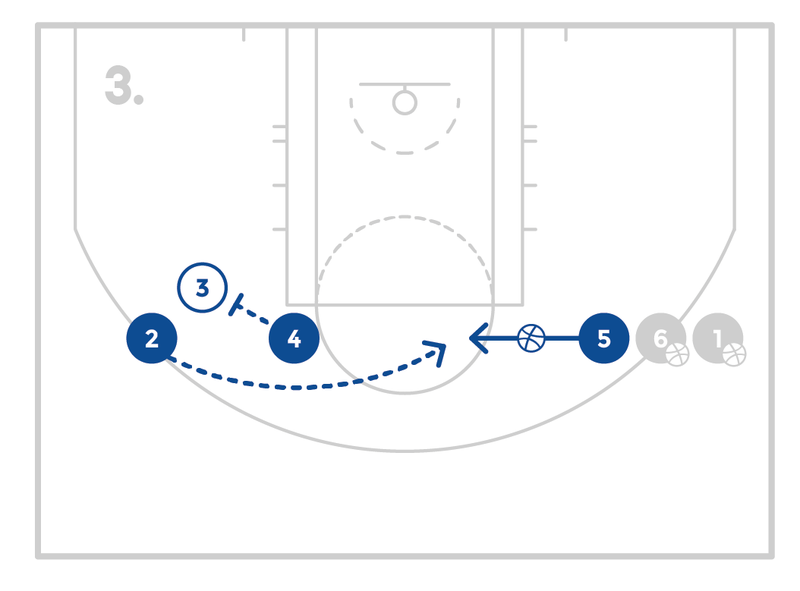 The offensive player comes off the screen to catch and shoot and go to the back of the line. The defensive player now becomes the shooter and the screener now becomes the defensive player. 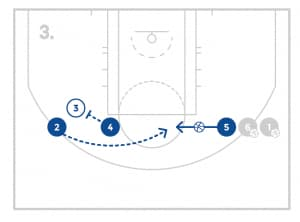 The player who made the original pass now runs across and becomes the screener. 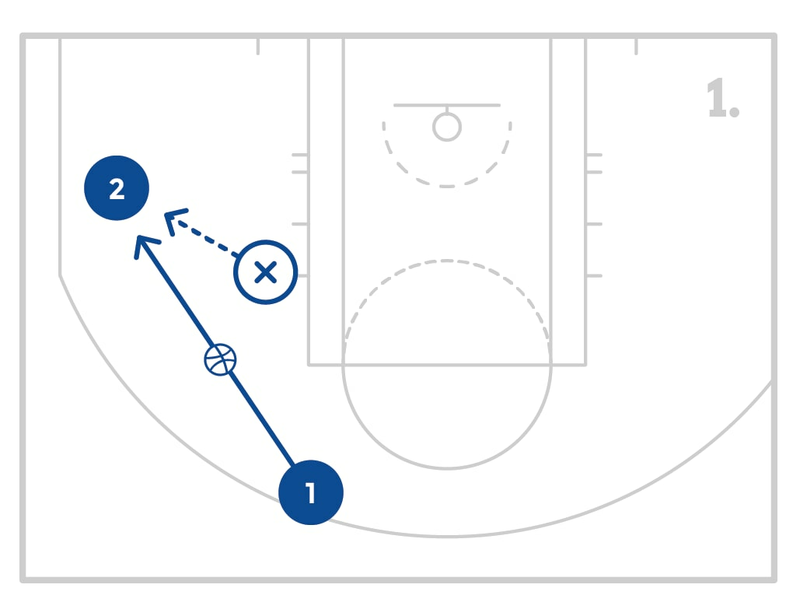 Work on this drill as a team to make a lot of shots quickly. Have the players get in groups of three and find space at a basket. Utilize as many baskets as possible and have at least 2 groups per basket. 1 player will be a defensive player. The other 2 players will be on offense not too far from each other with one ball. The defensive player will guard the player without the ball and start by being in “help” defense and saying “help, help, help”. The offensive player will pass the ball to their partner. The offensive player will then pass the ball back to the other offensive player. The defensive player will jump into the help position and say “help, help, help”. The offensive player will then shoot. The defensive player will locate their offensive player, tag and pursue the ball. Have an offensive player in each corner and on each wing with a ball and a corresponding line on the baseline. The players on the baseline will close out to the players on offense. When the coach says, “ball up” or “ball down” the offensive player will put the ball up over their head or down in the trip threat stance. When the player moves the ball up, the player will push off their back foot and step closer to the player with their hands in the right defensive positioning. When the player moves the ball down, the defensive player will push back off their top foot. Work on the players moving efficiently as defenders and not wasting any movements. Have an offensive and defensive player start on each block. The coach will start with the ball on the wing. (Make sure you teach or have taught the players how you would like them to defend a big to big post screen without switching). 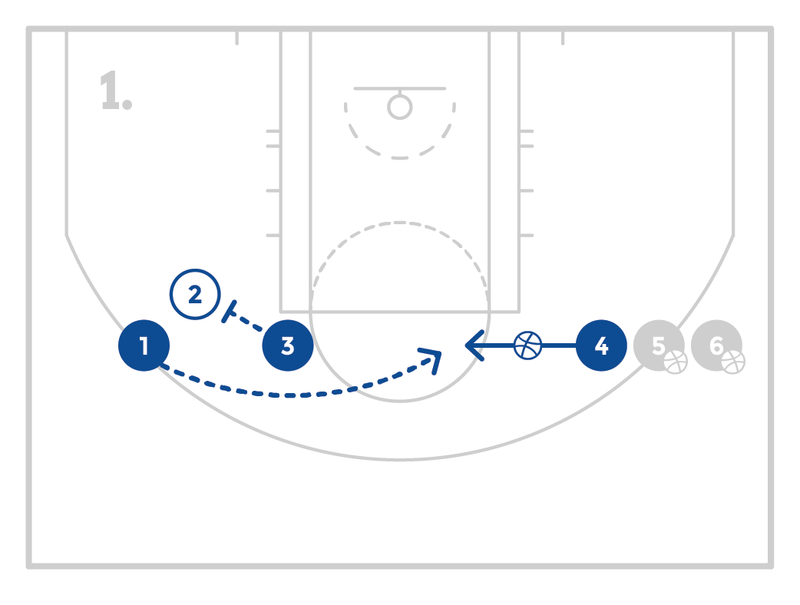 Let the player on the ball side set a cross screen for the opposite big. Let the players work on properly defending it for several reps before adding the pass in and letting the play. Offense will rotate to defense and 2 new offensive players will come in, or if you don’t have enough post players rotate new players 1 spot at a time. Have the post players start in a line on the baseline with a player in the corner and a defender guarding him. 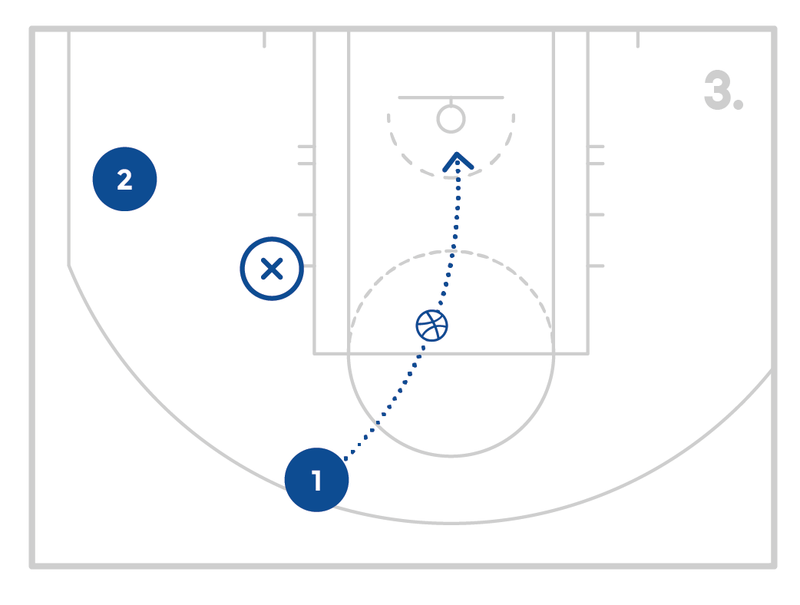 The first player up will run up and set a screen for the coach in the opposite slot so that the coach is moving away from the player in the corner. 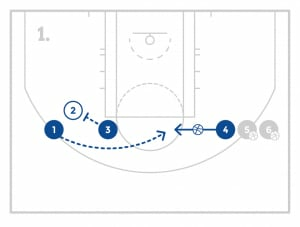 The coach will pass it to the post player rolling. On the catch, the post player will quickly decide if the defender is helping or staying on the player in the corner. If the defender is helping, the roller will pass to the corner for a shot. If the defender isn’t helping, the roller will finish. The roller will become the corner shooter and the corner shooter will become the defender. The defender will step to the end of the line. Have all the guards get a ball and start up high on the wing. Place a cone or a chair as the screener and have the coach act as the on ball defender. If the coach goes over the screen, the player will dribble off the screen for a pull up jump shot. If the coach goes under the screen, the player can stop behind and shoot or simulate a simulate a rescreen and come back off the other direction for a jump shot. Work on this from both sides and encourage the players to make good reads. 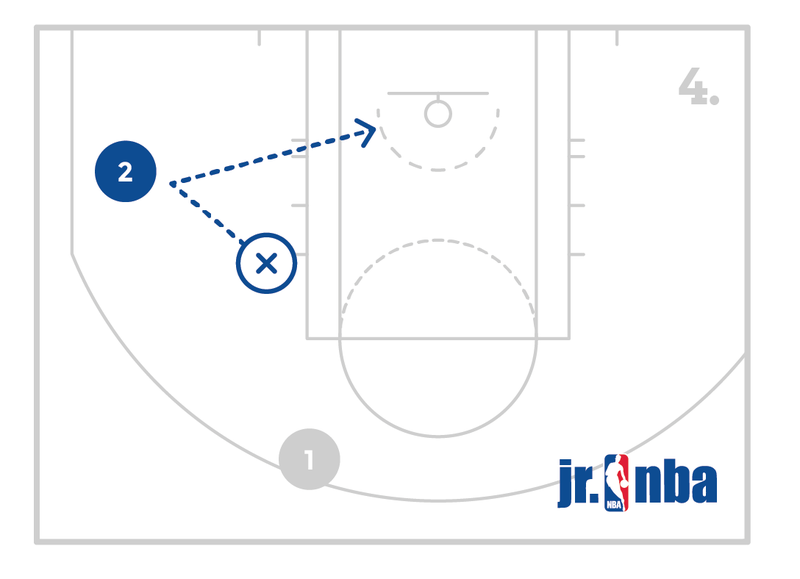 Place a cone or a chair as the screener and have the coach act as the defender who is guarding the screener. 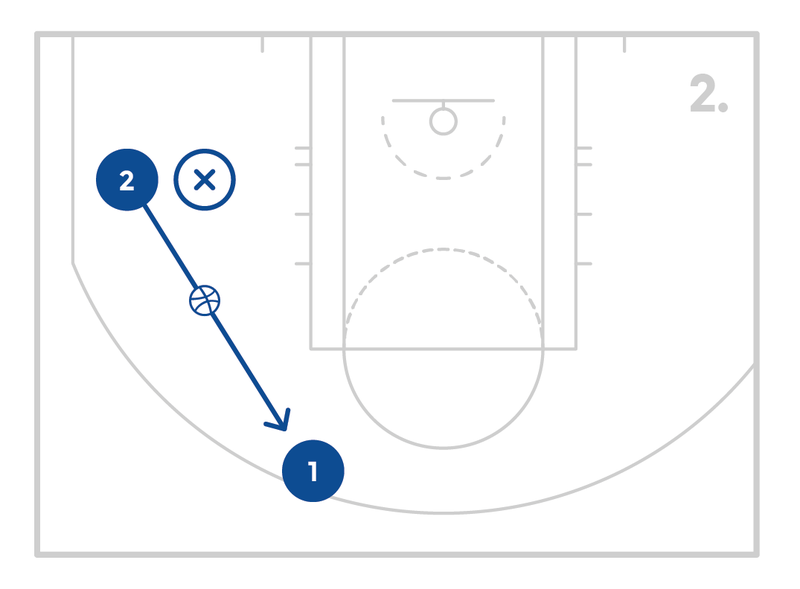 If the coach steps out to hard hedge, have the players split for a shot. If the coach sits back, have the player come off and shoot or freeze the coach and attack the basket. Divide the players into teams and play 5 on 5 half court. Play games to 5 makes and ensure the players play hard the entire game. In this version of 5 on 5, after the first pass, no player is allowed to have the ball longer than 3 seconds or it will count as a turnover. If the offense scores, they keep the ball. Keep the energy up and work on everything practiced.